These were the words of out-going International Trade Union Confederation president Michael Sommer as he opened the 3rd World Congress of the ITUC in Berlin yesterday. 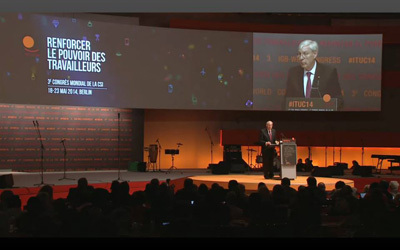 With over 3,000 in attendance and a raft of debates and decisions to be taken throughout the week, Sommer’s speech set the tone for what will be the first global gathering of the ITUC trade union centres since the financial crisis. Indeed many of the opening salvos were levelled at big financial interests and the governments that openly support them. ITUC general secretary Sharan Burrow drew similar battle lines with neo-liberalism, saying unions’ role was now to actively stop the spread of the “corporate jungle”. Citing World Cup 2022 hosts Qatar as a major offender against workers’ rights, she said the ITUC would provide a comprehensive list of which countries are the worst for workers later in the week. Whether it is a bad boss or a pro big business government, all are in for a rough ride in Berlin.